If, heaven forbid, you find yourself in a situation where you are able to provide quick assistance to someone, I hope you can ignore what is going on in California and just go ahead and provide the care. A couple years ago, a woman pulled her friend from a car wreck and the legal battle is still going on about whether or not she should be liable for the disabilities suffered by the victim. We often tell people that helping someone in an emergency is the right thing to do, as long as the assistance you provide is within your training, you act in good faith, and are not negligent. But, as it turns out, there may be conflicting laws in certain states and it may not be obvious how 'covered' you are in your actions. Now, in this particular instance, I think there's more to the story than what can be read in articles such as Sierra Sun. The victim and 'rescuer' had been smoking dope and were returning from a bar, so I'm not convinced the rescuer used clear judgment in her decision to pull the victim from a car she thought might blow up. I don't imagine cars really blow up that often and the normal procedure is to not move a victim unless absolutely necessary to deliver care or if the current situation becomes unsafe. Leaving her sitting in the car would have been the easiest, sanest choice unless there was flame or maybe gas odor. So, how does this effect Scouts and the rest of us? Well, I see it as just another reason to remain calm and cool in situations so clear, logical decisions can be made. As long as you keep your head and are providing assistance within your training, doing a Good Deed of any magnitude is the right thing to do. Letting the possibility of repercussions inhibit us from offering aid is the worst outcome of these sorts of events. Do you know Mohamed Jaisham Ibrahim? Yeah, me neither, but that's him in the photo. He's a hero today after putting himself in the way of an assassination attempt on the president of the Maldives. He is also a 15-year old Boy Scout that now has a knife injury to his hand for a badge of bravery. His quick actions and being in the opportune location make for a great story and promotion of scouting. I expect we'll be hearing a bit more about the details over the next few days. 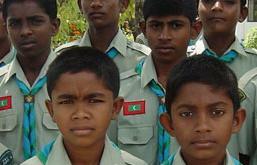 Those guys in the picture are just some Maldives Boy Scouts in uniform - don't mess with them! Take a look at all the stories showing up in Google News for details. From the Scout Handbook - "A Scout is trustworthy. A Scout tells the truth. He is honest, and he keeps his promises. People can depend on him." It is easy to trust someone, even strangers. We do it every day. I trust that drivers will stop at red lights. I trust the cashier will not steal my credit card invormation. I trust the garbage man will collect the trash every Tuesday. This trust is in place because I've experienced the correct behaviors over and over. Drivers ALWAYS stop at red lights, so I trust they will continue to do so. But, the behavior is forced by laws, not by some belief held by all drivers that stopping at red lights is the right thing to do. All trust that we have of strangers is forced, either by laws, contracts, or some similar regulations. That is where a Scout is different. He is trustworthy not because he is forced to be that way, but because he chooses to be. His honor is the only regulation that enforces his trustworthiness. That is why the words, "On My Honor", are so important to a Scout - his honor is the only collateral he has to offer to ensure that he can be trusted. If a Scout has no sense of honor, then the Scout Law and the Scout Oath lose their meaning and strength. For that reason, it is a critical task for leaders to explain and demonstate honor and then nurture and strengthen it in Scouts. By establishing a strong sense of honor, all the other aims and goals of scouting can take place. A trustworthy person arrives on time, commits to tasks he can handle, and completes both boring and difficult tasks on time. He is punctual, prompt, and perseverent. He realizes that fulfilling simple, basic commitments and expectations every day lays the foundation of trust that extends to more challenging situations. When others see that he completes tasks, they trust him with more and more responsibilities because he has earned that trust. I just reviewed my list of 2007 resolutions that I've had pinned to the wall here by my desk. Of the 13 resolutions, I successfully completed 10 and 2 were outside of my control. Not bad!